Didn’t manage to eat all the bananas you bought? And now all you’re left with is half a bunch of soft, black bananas that no one wants to eat? Bake a banana bread! Ripe bananas are perfect for this delicious, moist banana bread. Each slice is packed with potassium and it is easy to make. Banana bread is very versatile and can be used in many ways. Cut this moist loaf into thick slices and use in lunch boxes or enjoy as a snack. Use it for French toast with coconut milk in the egg mixture. Delicious, moist banana bread is perfect for a healthy lunchbox. It is delicious as cake base in a trifle with tropical flavours and coconut shavings. Or sandwich it together with smooth apricot jam and serve with custard. For variety you can add a number of ingredients. Next time add a handful of chopped pecan nuts, other dried fruit or even some chocolate chips for a special treat. Substitute 250 ml of flour with the same quantity Nutty Wheat. Substitute the castor sugar with xylitol. Preheat oven to 180°C. Butter a 23 cm x 8 cm bread tin and dust with flour. Mash the bananas, add the salt and set aside for a moment. Mix the mashed bananas with the butter and sugar mixture. Beat the eggs well and add. Heat one tablespoon of the milk. Add bicarbonate of soda to heated milk and allow it to foam. Add this to the rest of the cold milk. Mix milk into banana mixture. Sieve cake flour and baking powder together. Bake at 180°C for one hour. So next time, don’t throw away those black bananas. 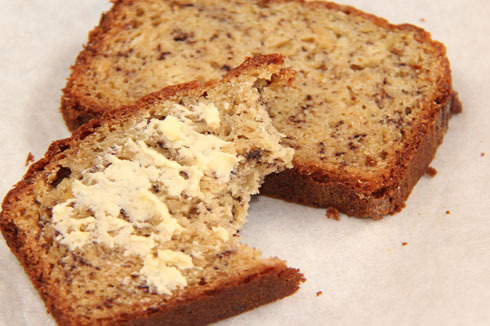 Instead, why don’t you surprise your kids with this tasty banana bread in their lunch boxes?